We are running a campaign in collaboration with the popular Nobunaga no Shinobi TV anime (original manga writer: Naoki Shigeno) that is set in the Warring States period (about 1493 to 1590). We have had two original pictures produced to create some stickers. 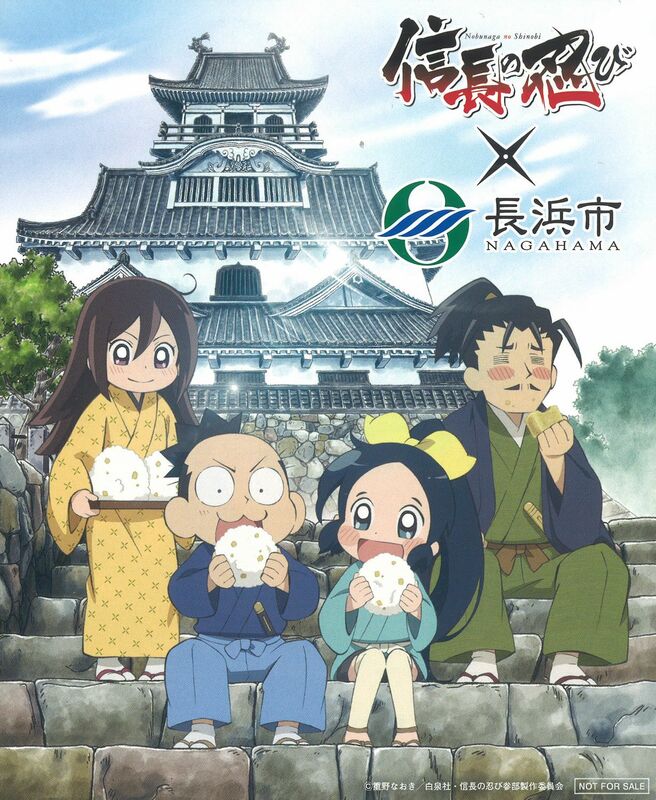 One sticker depicts the main protagonists of Nobunaga no Shinobi – Chidori, Nobunaga, Hashiba Hideyoshi and Nene (Hideyoshi’s wife) against a background of Nagahama Castle. The other sticker depicts Azai Nagamasa, Oichi no Kata (Nagamasa’s wife) and Chacha Hime (their daughter) looking at Chikubu Island in Lake Biwa from Odani Castle where there live. We will give these stickers to the first 300 visitors to both Nagahama Castle Historical Museum and Odani Castle Sengoku Historical Museum to commemorate this. You just have to say the following at the counters of these facilities: “I want a Nobunaga no Shinobi sticker!” Please use this opportunity to collect these two original stickers! *The design of the sticker differs depending on the facility. *This campaign is limited to one sticker per person at each facility. *This campaign will end when the stickers run out. We will inform everyone on the tourist website when this campaign ends. *Please do not resell these stickers. ©2016 TRAVEL GUIDE NAGAHAMA MAIBALA OKUBIWAKO All rights reserved.